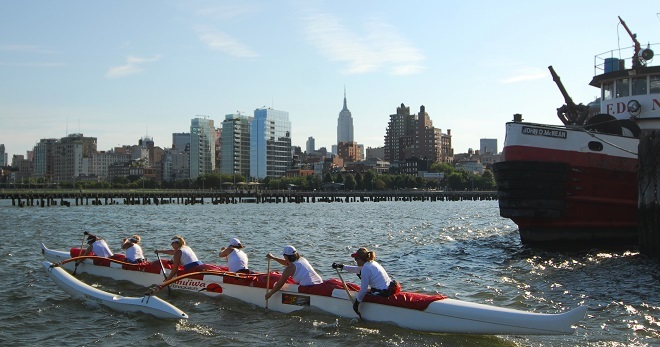 The 20th annual Hawaiian Airlines Liberty Challenge, hosted by New York Outrigger will be held on Saturday, June 11, 2016 at Hudson River Park‘s Pier 26. The day-long competition is divided into three races. Within each race there are several divisions. *Start times and race order are subject to change. Nearly every East Coast outrigger club who attends Liberty offers their spare canoes to visiting teams. To ensure that every available canoe is used, New York Outrigger coordinates all Liberty boat loans for visiting teams. Teams looking to borrow a canoe are asked to refrain from reaching out to clubs directly, as it creates confusion and the chance of double-booking a canoe for a race. Boat loan requests can only be made through the crew registration form on PaddleGuru. Completing registration does not guarantee a canoe. Requesting teams will receive a confirmation email once matched with a boat. After the boat loan deadline, teams needing a canoe should not register without prior approval from the Liberty Registration team. NOTE – boat loans may close early if the inventory of available canoes is exhausted. With the growing popularity of Liberty and the limited supply of canoes on the East Coast, we cannot guarantee a boat for every team that registers to compete. For the best chance at securing a canoe, we ask that you complete your registration form, waivers, and provide all payments as soon as possible. While boat loans may close early, visiting teams are encouraged to continue contacting us if interested in competing, as additional canoes may be identified for boat loans closer to the event. Registration will open on February 15, 2016 on the PaddleGuru website. For purposes of boat loan priority, teams will be ranked based on the date they complete both PaddleGuru registration AND make full payment of all fees. The Hawaiian Airlines Liberty Challenge is not a fundraiser and all registration fees go directly to cover event costs. Therefore, should the event be cancelled by the Race Director due to weather or other safety concerns, refunds will not be provided. Mahalo for your understanding. Questions about registration can be directed to Liberty Registration. Paddlers in search of a race crew are encouraged to post on the 2016 Hawaiian Airlines Liberty Challenge event page on Facebook. East Coast outrigger clubs will often look for additional paddlers closer to the event date, and paddlers are welcome to form a team on their own (with or without club affiliation). Once connections are made for a full crew, the crew captain can register the team. All paddlers are required to complete a waiver to participate in the Hawaiian Airlines Liberty Challenge. As soon as your captain has registered your crew, your captain will have a link that should be sent to you to allow you to complete the online waiver. Please contact your captain for the link. Hawaiian Airlines Liberty Challenge officials reserve the right to refuse any display of sponsor logos including but not limited to canoes and apparel. No airline logos may be displayed at the Hawaiian Airlines Liberty Challenge other than Hawaiian Airlines. See RULES AND REGULATIONS for more details.